• A 296-page survey of 55 international ceramicists who bridge the worlds of product design, interiors, fine art and luxury craftsmanship. • Four thematic chapters are accompanied by interviews and written contributions on the subject from designers, decorators and collectors. 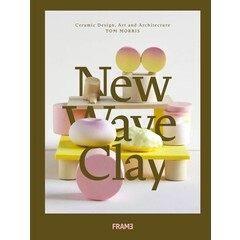 • Richly illustrated, New Wave Clay is an image-led, dynamic book that aims to demonstrate the contemporary condition of this age-old art. • Instead of focusing on traditional craft ware and functional pieces, this title focuses on the community of ceramicists who create design-led works.